Normally my schedule is organised. Orderly. I adopted the Microsoft calendar years ago on Windows Mobile, and migrated to Google calendar which has successfully managed my life for many years. That didn’t prevent me from turning up to work in the most casual of clothes, and moments later receiving a notification of the Northern Irish Pathology Symposium I had registered to attend. What happened?! Normally I check the plan for the coming day, but I ignored my calendar entirely. I had been off for a few days and was completely out of sync. At least I was in work earlier. I jumped on a Belfast bike, and a few minutes later I was on Botanic Avenue. Where would I get a shirt at short notice? The charity shops of course! But it was 8.40. Nobody goes to charity shops before half ten. And in this case, I did swing by the bakery. Well, a bakery of sorts. The Gregg’s on Botanic. 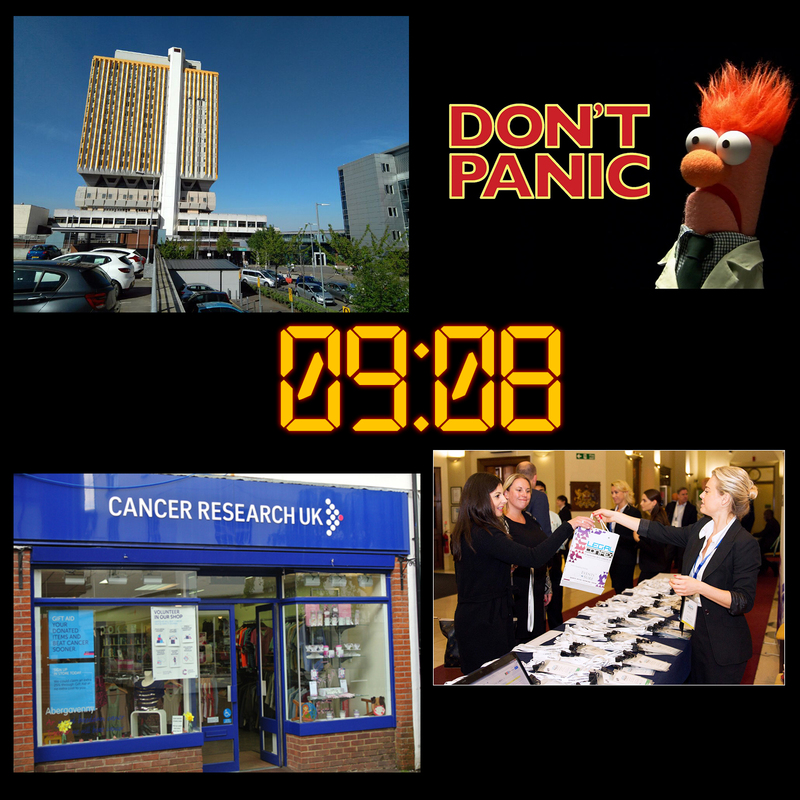 I had to kill time until 9, when the Cancer Research UK shop opened, according to Google at least. As frustrating as an organisational failure can be, at least in this job I’ve got the flexibility to work around it. One steak bake later and it was time for shirt hunting. Only the finest garments are purchased over a period of minutes from a limited secondhand selection. I jest. I’m a big fan of charity shops, and the re-use culture. We’re too attached to having shiny new things, which may be nice for the first few moments but your ladle doesn’t really care whether its brand new or not, if it’s in decent condition. This has suddenly become a dramatic story. I’m running out of time. I’ve got until 9.30 before things kick off, but registration is at 9. Some activity. People pause outside the shop. Workmen. They move on. I’m running out of options. Attend the pathology symposium with a Batman t-shirt proudly, or skip it entirely. Still no movement on the shop front. I don’t know about other places of work, but I had to be in for the time my shift started. Not plus or minus ten minutes. If this was TV, there would be a 24 style split screen showing me nervously loitering around from the entrance, the front of the shop, the front of the city hospital, and the symposium registration desk with pathologists signing in. This is getting mad. But I’ve committed to it now. I’m in. Snuck in alongside the volunteers and staff. Found the shirts, and I start getting picky. I don’t really want a Primark shirt, from a charity shop. But there’s no time. I pick up a nice patterned one and bring it to the till. They’re still starting the till. A whole rigmarole of button presses is required, and a heated conversation between colleagues. Thankfully they can ring up my sale before completing whatever arcane ritual was required by the gods of tillery. As I’m waiting I start to notice the shortcomings of the shirt. Frayed in places. Loose threads. It’ll do. Or rather, it’ll have to do. I wear it out of the shop. I’m out! And now walking rapidly in the direction of the city hospital. I can still make it on time! I’m now wearing a shirt over a t-shirt on the hottest day of the year. It’s supposed to get up to 30 degrees Celsius. Time to sweat. On time for registration, grab a seat, and I’m one step away from spontaneous combustion. As much as it would be a delight to provide evidence of the phenomenon to a room full of pathologists, I excuse myself and exchange the t-shirt and shirt combo for the shirt on its own, hiding the t-shirt so I could pick it up later. No-one was any the wiser. I didn’t exactly fit into the formal suited crowd, but it was enough to get by. Thanks to Belfast Bikes for facilitating my fast transit around the city. And thanks to my disorganisation for giving me something else to write about. I’m glad I did make it, because it turned out to be an interesting morning with talks involving haematology, microbiology, chemical pathology, and digital pathology. And I caught up with a few folks I hadn’t seen in a while. Thank the shirt for enabling my passage into a slightly more professional world!